By far my favorite of these shades is Bahama Mama because it's been around for SO long and the color is perfect for fall and winter. It's a berry color; after two coats its dark but it still gives pops of color. I've done one coat before to make it look lighter and with a top coat you really can't tell! I also really love the idea of a silver accent nail, especially with a dark shade like Bahama Mama. #1 and #6 are two of Essie's gel couture collection. I mentioned a few weeks ago I wanted to try these and I'm happy to say I did and I LOVE them!! They're worth the money, and really look so great on your nails. It doesn't last as long as a gel mani from the salon does, but it does the job. What's your go-to shade for this season? That Bahama Mama shade is REALLY pretty! It's not a cliche holiday color, but it still would be perfect for Christmas time! I might have to go buy it! Those are beautiful colors. I really like #2, #5, #11. Thanks for sharing! Those are all really beautiful colors that I would have to say my favorite is #2! It's always been my favorite color. I love that surrounded by studs color - #6!! How does the Essie gel come off?? I want to try it soon!! 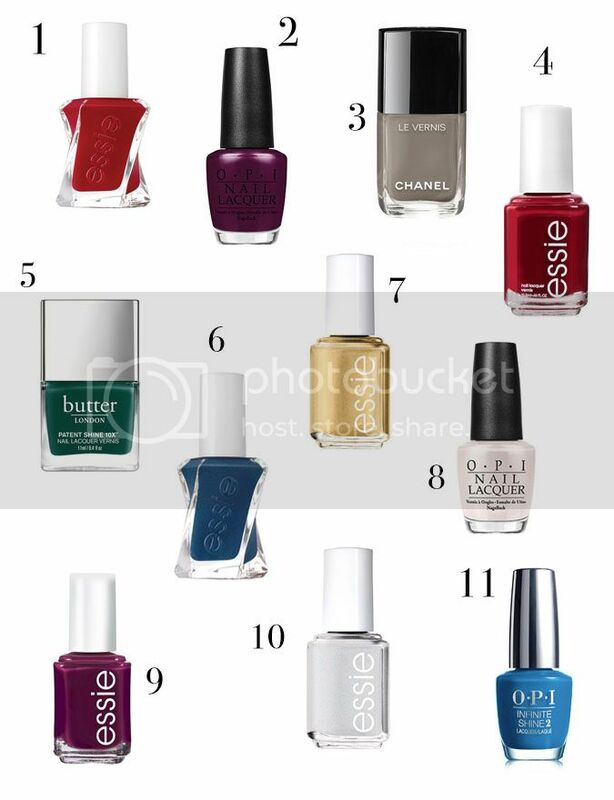 Love these shades... especially number 1! I need it for Christmas parties! Essie polishes are my favorite! I love #4! Fall nail colors are my favorite! I have so many of the OPI colors that I love! Love that shade! Also really love that Chanel hue. I like #5 and the purple shades! Love those colors but especially #2 & #3! This season I'm really love the dark greens and purples. I also like a warm berry or orangey-brown color. Across the Pond by Butter London looks like such a pretty shade! Oh my gosh I love these all! My favorites are navy, and gray for fall. Love! These colors are gorgeous! I'm in love with the Essie surrounded by studs shade. I would like to try the purple like yours! It's really gorgeous. I've started gravitating toward more of the pewter and charcoal color this year. I'm really liking the Chanel Garconne. it should work with anything. I absolutely love that color by OPI! I got Huntress by Formula X in my ipsy bag and holy do I LOVE it😍 I gravitate towards less color though but winter with some reds is great. Such a beautiful color, I would love this to my nails. 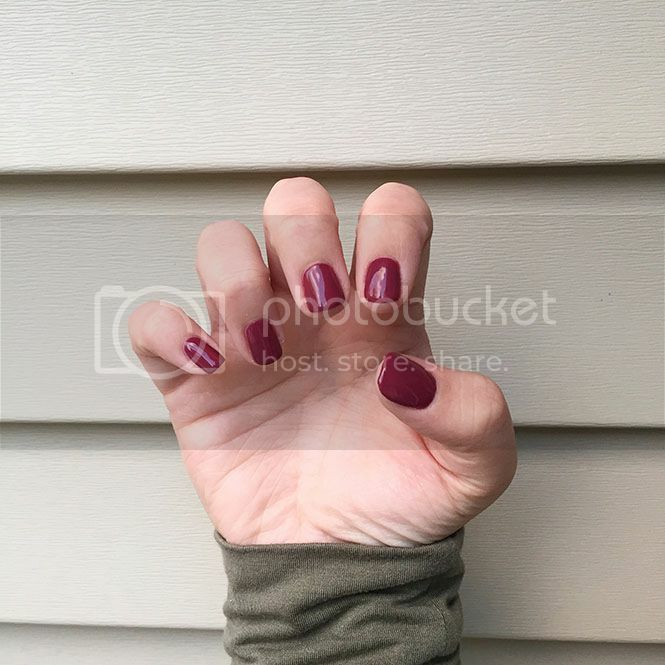 I am loving purple nails this season! I love that OPI shade. I wonder if it comes in gel. All these are beautiful colors and totally fall appropriate! Early this fall I had some adorable nails that were similar to #2. I love dark reds/browns for fall. I do like the darker shades this time of year. How wonderful though that you put in some whites! Such great picks! I usually go for a deep red this time of year but lately I have been loving olive and grey! I love the featured Essie shades! #4 and #9 are my faves, and the OPI Rich and Brazilian is lovely too! Deep dark reds, purples, and burgundy are my default color of choice. These are all awesome! I love the brands that you picked as well! The #7 shade really caught my eye! Soo pretty! Oh I absolutely love all of these shades! I got a pedicure recently with the #2 opi color and loved it! Omg so many pretty colors!!! I have been obsessed with reds lately!!!! I love them all but the Chanel Garconne is gorgeous. I need to have it now!! Truly an awesome multi-colour nail polish.This is my favourite colour.I also purchased some fashionable nail polish from tilly..which gives latest fashion accessories with cheapest price and much more. I also bought some fashionable dress using Tillys Promo Code you can also save your maximum money. I would like to say thanks for share that. It was more impressive and helpful for us. Nice shades. I paint my nails because i think it looks great when you have colored nails in different colors. I like to experiment with different colors and to make artwork of my nails. Thanks for sharing surely gonna try these. These colors are gorgeous How wonderful thought that you put in some whites! too good information thanks to share with us. It is very good information for people who love to make nails suitable for women who like beauty is very interesting. Interesting stuff, lovely post for beauty lover.